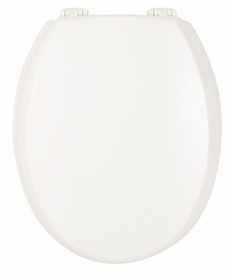 Bemis Moulded Wood Toilet seat finished in White with Chrome Plate finish Hinges. Universal seat with adjustable chrome-plated hinges. Fits all standard bottom access pans. Hygienic and robust for Individual , private or Hotels .Chrome plated individual Hinges.